The Hotel Ochsendorf is perfectly located for both business and leisure guests to Horni Blatna. All hotel's guestrooms have all the conveniences expected in a hotel in its class to suit guests' utmost comforts. Each of the hotel's guestrooms offers non smoking rooms, television, bathtub, shower, mini bar, balcony/terrace. This beautiful Horni Blatna accommodation provides bar/pub, meeting facilities, restaurant, pets allowed to suit all guests' utmost convenience. 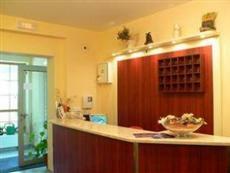 In addition, the hotel's guests can enjoy the leisure and sports facilities provided on the premises: jacuzzi, sauna, spa. These top-class facilities are complemented to excellent services to meet the needs of visitors to Horni Blatna. To book a room easily at the Hotel Ochsendorf, please submit your travel dates and proceed with our secure online booking form.